Pot sizes can vary from year to year, usually because we change suppliers based on who we can bully, guilt, blackmail or plead to give us a better deal. All of the options we have available now or in the near future will be listed above. Below is a description of options usually available. 60-90cm : 1-2 year old tree with a single stem. Usually comes in a 3 litre pot or more. Takes up less space than a bush. 90-120cm : 2-3 year single stem. Comes in 3-7 Litre pot. Takes up less space than a bush. 5 Litre Bush shape : Usually comes as 60-120cm,2-3 years old and predictably comes as a bush shape. Lets more light and air into the centre canopy, good for vigor and fig tree health. 150-200cm : 2-3 year old Half Standard 5-12 litre pot. Very pleasing ornamental shape. 125-150 cm : 2-3 year old tree with a single stem and shaped as a Quarter Standard or Half Standard . Usually comes in a 7-15 litre pot. Pleasing ornamental shape. 180-240 cm :This is a 3-4 year old fig tree that has been pruned to be a half standard shape. This means it has a long length of clear trunk for a pleasing ornamental shape. Usually comes in a 10-20 litre pot. Bush : The main stems of the fig tree frame work start quite low to the ground and branch out sideways and then up to form an inverted cone shape. Forms an open canopy allowing more light and air in which is a good thing. Quarter Standard : A single upright stem with side branches. The first branches occur roughly a quarter of the way up the tree. A pleasing ornamental shape. Half Standard : Very similar to the quarter standard except roughly half of the lower stem is clear of side branches. Arguably there are more figs on a bush shape because there are more branches. The figs will be the same on either for most people however the fig forensic puritans could argue that on a microscopic level some of the bush figs would/could/might be slightly superior due to more access to light and air. The main difference between them is mostly aesthetic, some people just prefer a fig tree to have a rounded head of foliage instead of an unruly bush. A taste of the Mediterranean attractive garden tree, with its strong branch structure creating an interesting appearance. Figs from this tree are exceptionally tasty brownish-purple fruit, which is produced twice a year, in late spring and again in late summer. 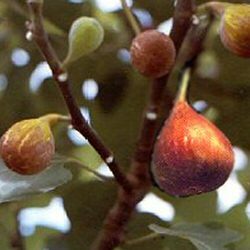 Brown Turkey fig trees could produce fruit the first year depending on the weather, some are even delivered with figs on them already. Folklore states that the Greeks, the Spartans and athletes included figs as their staple diet, as it increased their strength and swiftness. In fact, in ancient Greece it was forbidden to export figs. During the time of the Roamn Empire, in Latin mythology, it was dedicated to Bacchus (Dionysus) the 'jolly god' who was supposed to have gained his vigor from the fig tree. Figs were used in religious ceremonies. In fact, figs were held sacred by the Romans because the wolf that suckled Romulus and Remus rested under a Fig tree. Figs were offered as presents during the celebrations of the first day of the year by Romans. The inhabitants of Cyrene crowned themselves with wreaths of Figs when sacrificing to Saturn, as he was said to have discovered the fruit. The fig was considered an antidote against poison. Much interesting history that will make your Fig tree a worthy addition to your garden. Expect a final height of between 5m and 7m (15ft and 21ft).